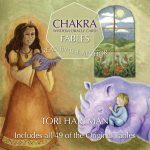 Listen to Tori read the original fables that were told to her by the angels all those years ago. These original 49 fables will come to life as she takes you through each fable one-by-one, an experience that provides an extra level of learning. You will: Gain insight from the very place that it all began — The Fables themselves. This one is for you if the toolkit book feels a bit “vague” sometimes. The audio files feel much “tangible.” They explore the cards with deeper insights and lots of reading episodes, and you can feel the energy, nuance, and intention of Tori directly because they come as audio files. These are absolutely fabulous recordings and an amazing look at the cards and the there origin stories. I feel this is invaluable to a card reader and really helps you to connect with the cards. Theres a ton of information here you are not going to find anyway where else! I love listening to every minute of the recordings (even over and over again).